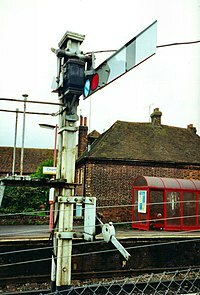 One of the earliest forms of fixed railway signal is the semaphore. These signals display their different indications to train drivers by changing the angle of inclination of a pivoted 'arm'. This page was last changed on 1 July 2017, at 23:59.